Michaela Light: Here with Brad, Luis, and Gavin, all from Into The Box Conference, and I am going to find out exactly what this conference is all about. I think there's some ColdFusion secrets gonna come out. I can read some in that white board behind you guys so it's not too secret. Oh, he's covering it up now. All right, Luis. Into The Box, who is this for? Someone's never heard of this conference, who's it for? Brad Wood: It's for everybody, Michael. ColdFusion developer that wants to take their developer to another level. 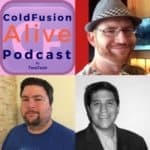 Gavin Pickin: Yeah, we're trying to showcase the tools and the processes that ColdFusion developers who want to modernize their practices, modernize their applications, who want to adopt a competitive edge thing, that's what we're showcasing. We're not just covering Box products. There's a lot of sessions that aren't about Cold Box, are just generic stuff on doctor and other technologies like that. Luis Majano: Architecture, business processes. It's important for us to have a well-rounded developers and not only just about specific language or specific products. Obviously Cold Box, it started, but there's a lot of boxes around the ecosystem now. Michaela Light: How many boxes are there now? Luis Majano: Oh my gosh. Luis Majano: Innumerable boxes. The latest box over here, it's the writing on the board. Gavin Pickin: We come up with new ones every day. Luis Majano: Oh yeah, but there's many boxes nowadays, I think maybe seven or something like that. Gavin Pickin: Oh, I can think of more than that. Brad Wood: Yeah, there's plenty of boxes. Luis Majano: Plenty of boxes. [crosstalk 00:01:56] plenty of boxes to go around. Luis Majano: But the whole conference is about empowering ColdFusion developers to modernize themselves. Also take a look at a job that was a great companion. We do it day in and day out as well. Uh huge ecosystems, so how to teach and showcase the integration pieces between CFML and Java and we do this a lot in everything that we do. A lot of techniques for developers. A lot of business processes. Continuous integration processes. Testing processes, which a lot of developers hate. This is something that's very big for us. You'll see that from the sessions, there's a big gamut of coverage. Brad Wood: Oh yeah, even some Java script thrown in there with some. Little bit of everything. Gavin Pickin: That and our elixir project, we're throwing a few bones to the front-end developers. Michaela Light: All right. Best to do that otherwise they start biting. Michaela Light: When is this conference? Luis Majano: It's April 26th. The conferences starts with workshops, so training workshops, one on one, so we have private workshops at this point. Gavin Pickin: These are all day workshops. [crosstalk 00:03:23] Feedback. Luis Majano: All day workshops, feedback on some box products. Michaela Light: There's five different workshops, you pick one. Right? Luis Majano: Yes. You pick one, or if you want to skip around that's really up to you, but you have access to the workshops. We have BDD for behavior developments to building restful services to content box CMS with Gavin, command box deep dive with Brad, and we have the preside guys coming from the UK as well. They'd have a tremendous content platform as well, so they were gonna be doing a free workshop, so anybody could attend as well. Luis Majano: April 27th is the initial day of the conference and April 28th is the second day of the conference. Michaela Light: And that's a Saturday Sunday, right? Luis Majano: It's a Thursday and Friday. Michaela Light: So it's Wednesday, Thursday, Friday. Gavin Pickin: So the two conference days will be two tracks per day. We'll have two simultaneous sessions on each of the two conference days, and the workshop day's just all day workshops. Michaela Light: All right. And then when you get into the conference, you've got tracks and you've got a few keynotes, is that the layout? Michaela Light: What was that phrase, Brad? Michaela Light: Are we back in high school? Gavin Pickin: We want to debunk some of those myths. All the myths about Cold Fusion being dead, and the tools not up to par, we want to address those myths, and we want to realize that there are some issues we can improve on, and how we're gonna get there. Luis Majano: Basically go through our box road maps, all the different products that we have, and also new products. These are a great way for us to present what we're doing, and how we want to move Cold Fusion and CFML forward, because we do have the modern tool sets that are even better than other languages. Michaela Light: [crosstalk 00:06:21] So you might call this conference the face of modern Cold Fusion development. Michaela Light: Yeah, I think you should use it. Definitely. So if folks want to come to this, where is it happening? Luis Majano: It's in The Woodlands, Texas. This is in Houston, Texas, and the little city is called the Woodlands, a little bit north of Houston, about 30 minutes from the airport. Very centric and very reachable. It's here in the mega Houston area. Brad Wood: Absolutely. It's kind of a big thing for us. Even international flights, there's a lot of international flights that get you straight into Houston, and we definitely want to be in accessible location for sure. Luis Majano: We even have United helping out, so United has this for us, Houston is one of the major hubs. So if you fly United, you can get up to 50% off of your tickets and come here. Michaela Light: All right. If we can't make it, is this thing recorded, or do we have to turn up if we want to see it? Luis Majano: Well you have to turn up, right? But if you don't then we're trying to find out if we can actually do all these recordings, and most likely they will be available later on, most likely at a price, but we're still working on that, to have them recorded for that. Michaela Light: All right. Is there a website for this conference, and what is the URL if there is? Luis Majano: Yes. It is intothebox.org. Michaela Light: Intothebox.org. Let me just see if we can go there. Let's go to. Luis Majano: We put a lot of effort into our conference trailer every year. This year we actually went a little bit more fancy. Michaela Light: Which one of you three is on this horse with the lasso? Brad Wood: I think that's John Clausen. Michaela Light: So right now as we're doing this interview, it's 49 days 15 hours away. Luis Majano: Oh yeah. Getting close. Michaela Light: Getting close. I won't play the trailer, because I'm not sure that zoom can deal with video in video. But knowledge, community, craft, improving yourself, mobile apps. Here are the different workshops, one day workshops you mentioned. Michaela Light: RESTful services, testing. Brad Wood: Content box is free as well. So there's two trainings you can show up to free of charge. Because they are limited in space. We want to make sure that we can actually work one on one with you and work in a small group and really get you hands on in deep dive. Gavin Pickin: It's not gonna be a training with like 100 people in the room, right. It's gonna be a training with a maximum of maybe 10 people. Luis Majano: They're filling up fast. Gavin Pickin: There's a lot of faces in that community you should recognize, like Mike Brunt. Michaela Light: Charlie Arehart. You want to say anything about any of these, brad? 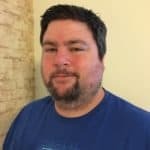 Brad Wood: We're pulling in a lot of people that are well known in the Cold Fusion community, and even people like Ray Camden and Matt Gifford that have made a good name for themselves even outside the community, and that's us pulling in stuff that's not just cold box specific, but its really good, solid developer content. Luis Majano: We're really fortunate this year to have NginX not only sponsor but also be there on sight, we have Mr. Kevin Jones doing session on NginX and microservices and how they actually inter operate with Cold Fusion so we're very excited to have them on board and Kevin is an amazing advocate, so we'll have him basically for the whole week, so very excited. Michaela Light: Yeah. And I recognize Pete Freitag, security, Cold Fusion expert, Dave Gallerizzo from fig leaf, who's really knowledgeable, and your own Esmeralda Acevedo, I'm saying her name right? Michaela Light: Mike Brunt, great on optimization, Gavin Pickin from you guys, Luis, you're here. You're speaking too it says. And we've got John speaking, he's big in the CFML community, so lots of impressive speakers here. Gavin Pickin: Lots of just us talking about our products too. That's something, that those who are not using box products might think that we're all about the box. Brad Wood: I am all about the box, Gavin. Gavin Pickin: But, we like to include other speakers and everything, and we use other tools as well, and we and that's why we gotta go speaker. Michaela Light: Yeah, and here's a list of al the things that are being featured here, and there's a lot of box things here, I can't even count them. Whoa. But, you're also looking at Cold Fusion and Lucee. Is anyone talking about Lucee at the event? Gavin Pickin: I think Gert Franz's session will focus on Lucee. As Mason, the lead developer at Lucee always says, “Performance is always a bug.” So if it's slow then it's broken. He's talking about pre factoring for performance. Michaela Light: Yep. Lot's of cool stuff. Just in case anyone watching doesn't know what Lucee is: open source Cold Fusion free version, totally separate from Mr. Adobe. Amazing stuff. Luis Majano: One thing we didn't mention that we're doing on day 2, which is our second keynote, is that it's a working keynote, and what we want to focus on is basically breaking out monoliths. Especially nowadays, everything's about microservices and at work, mostly what we're doing is building a lot of microservices based on docker and command box, and we want to take this whole hour just to showcase how modern it can be with CFML in creating microservices. It'll be Brad and John Clausen showcasing how you can attack, basically, a legacy and procedural elephants, and start decomposing it into different types of microservices, how to a time program through cold box mvc, if it is an mvc application, and just really showcase that you can really tackle that legacy and procedural Cold Fusion code and bring it to modern times very easily. 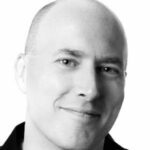 Gavin Pickin: That's one of the biggest things we're doing appliances we're really attacking those legacy applications and trying to help bring them forward more. CF7, CF8, and move them forward, you know, modernizing them as much as we can so we want to share that, educate everybody how we do it, and then we have instruction on how to make everyone bigger. Michaela Light: So taking these ancient elephant beauty over the years, and converting them to microservices, modern Cold Fusion. Michaela Light: Sounds like the way to go. I'm kind of curious. It's a lot of work putting together a conference. I did it myself with a lot of help from some other people at TeraTech, with CF united. I know you guys are really working hard to put this together, and is this the second or third year it's running? Michaela Light: Fourth year, wow. Gavin Pickin: In the previous years, we coupled it with the dev.objective slash cf.objective conference, and just did it a one day conference ahead of time, so this is the first year that we're really breaking it off as it's own stand alone thing, all on its own, three days of content. This is the fourth year we've put this on. Brad Wood: Yeah one thing just everybody wanted more content, they wanted to see more sessions, to offer more. So we had to break out and do that. Plus, the objective being three days, and we had a two day before that, that became a five day conference. Michaela Light: Yeah, that would be too long. Luis Majano: That mostly the reason, and we wanted to pick a centralized location as well, make it easy for people to come here. There's a lot of technology here in Texas, so I thought we thought it was time to detach and start fresh. Michaela Light: All right. And what a great initiative to help the CF community get even stronger. Luis Majano: Yeah! It's happening. One more place where people and developers can join forces, and reach to other developers. I don't think there's ever been anything here in Texas. Gavin Pickin: Another Cold Fusion development conference is a good thing too. Michaela Light: [crosstalk 00:15:50] Yeah, and it's pretty central from either side of the country, right? It's only a few hours flight. Prices in Texas are pretty reasonable, we're not talking San Francisco or New York City pricing. Luis Majano: Another big thing that we wanted to do is we wanted to make the price of 299 you get everything, from good swag. Me, I'm a swag aficionado. Luis Majano: Oh yeah. I spend too much time looking at swag stuff, so I want to make sure that people enjoy it and it's affordable. Luis Majano: Espresso machines would be available. Gavin Pickin: Oh yes. [crosstalk 00:16:40] service your addictions for swag and espresso all day long. Michaela Light: Is there a networking event? I heard there's a happy box? Luis Majano: Yes, we actually have two networking events that the workshop day we actually have rented out a which is in walking distance, so we have the full place to ourselves to just go there and eat and drink something. The first day the steeper workshop dinner, and then the next day is our big, big event that we always do, we always do a mariachi style themed event, so here in Texas we can go even bigger than in Minneapolis. In Minneapolis it was a task to find mariachi, but here a big surprise, let me put it that way. Luis Majano: Happy box event here will definitely be grand. Michaela Light: Anything else we should know about Into The Box before we close the interview? Gavin Pickin: I was just gonna say that the networking is always a big part of conferences for me, so that's why we want to make sure that we have plenty of time built in just for people to sit around and ask questions and brainstorm and decompress, because we get a lot of good ideas and feedback when we attend other conferences, so we're looking forward to the same thing at Into The Box as well. Luis Majano: I think that another big difference this year from the past three years is that since we have more time, and obviously a huge venue for us, we have a huge area for all the sponsors, so there's certainly great companies that are gonna be here presenting their products, and also us, the whole team will be here, the whole Ortus team, and we'll have a big area where people can come and actually get help and see all the different things that we're working on, all the different initiatives, and mingle and everything throughout the three days, which we've never had before. We just didn't have the time for it. That's a big benefit for everybody to get even more knowledge, because usually those kind of hallway conversations are the things that spark initiatives and things of that nature so invest in that type of environment for folks. Gavin Pickin: I think we have some espresso, Michael. Michaela Light: Ah okay. Yes. Definitely a programmer, right, a machine for turning coffee into code. Brad Wood: We've attended a lot of other conferences too, conference outside of Cold Fusion as well, we go to the other conferences to learn, see what they're doing to bring back to cold fusion, but also learn what makes a good conference, and what people are looking for and what they enjoy. This conference is done our way so we can thoroughly put the touches we want. I said we're even known make it available for people to do it with all the lessons and everything too. The interaction, the networking, it's very important to us, so we made sure it was a key part of Into The Box. Michaela Light: Great. Well everyone check out intothebox.org and have a great event. Luis Majano: Thank you Michael, appreciate it.